With the champions league games out of the way the focus turns to the Europa League tonight with Tottenham Hotspur, Liverpool and Newcastle United representing England. Travelling Spurs fans found themselves victims of a vicious attack last night by 50 armed people wearing masks and helmets to hide their identities. Lazio’s ‘Ultras’ were blamed for the attack, but Lazio club president has since denied fans were anything to do with the attack. One fan is believed to have been stabbed in the attack, and is in a serious condition in hospital. Interim Chelsea manager Rafa Benitez is said to have appointed former player Boudewijn Zenden as his assistant today. With much furore surrounding the appointment of the Spaniard as manager he insists he can win fans over and is targeting silverware in his time as boss. Speculation is growing about the future of Brad Friedel’s Tottenham career with Blackburn Rovers the latest club said to be interested in signing the veteran American goalkeeper. 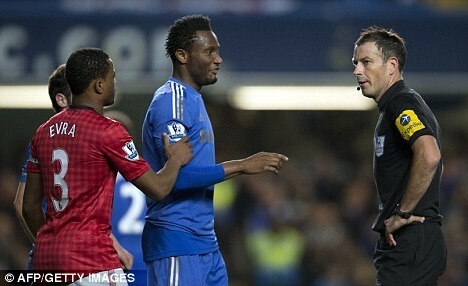 Referee Mark Clattenburg has been cleared of any charges relating to his alleged racist outburst aimed at Chelsea midfielder John Obi Mikel. The Football Association said there was ‘no case to answer’ and that no disciplinary action will be taken against the referee. Clattenburg is now said to be seeking compensation from Chelsea and also wants to club to make a donation to the ‘Show Racism The Red Card’ and ‘Kick It Out’ organisations. Just in on this matter, John Obi Mikel has himself been charged by The FA in regards to this incidence. He is being accused of ‘Using threatening and/or abusive and/or insulting words and/or behaviour (quite a mouthful I know) in or around the match officials’ changing room at Stamford Bridge. Didier Drogba has been refused permission to move outside the transfer window. The player had hoped a move would have helped him gain fitness for The African Cup of Nations. Manchester United manager Sir Alex Ferguson will have a statue erected in his honour on Friday to celebrate 26 hugely successful years at the club. Arsenal manager Arsene Wenger has praised the Scottish boss today saying his commitment has never weakened in his time there. He went on to praise the manager’s forward-thinking saying ‘He is always ready to move with the times and never speaks about what he has done’. Brazilian striker Alexandre Pato is apparently unhappy at AC Milan, and his agent has started talks with the Italian giants about leaving the club. This is news that is sure to set off alarm bells around Europe’s very biggest clubs, so we can expect Manchester City, Chelsea and PSG to be mentioned in regards to the striker in the coming months.